Last year, Google launched a feature called SearchWiki that allows users to customize search results. If you are logged in, you can remove search results, promote them at the top of the search results page and enter comments. While the feature is useful to personalize the results for frequent queries, the "wiki" component was only an afterthought. 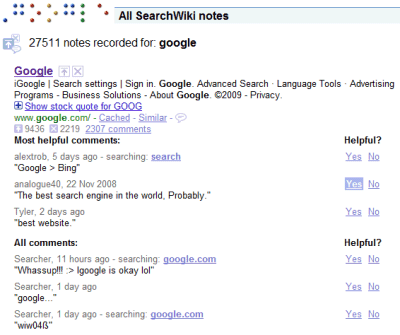 Check the SearchWiki page for "google" and you'll realize that the 27511 notes recorded by Google aren't very useful. Comments aren't helpful, even though Google tries to rank them by usefulness. 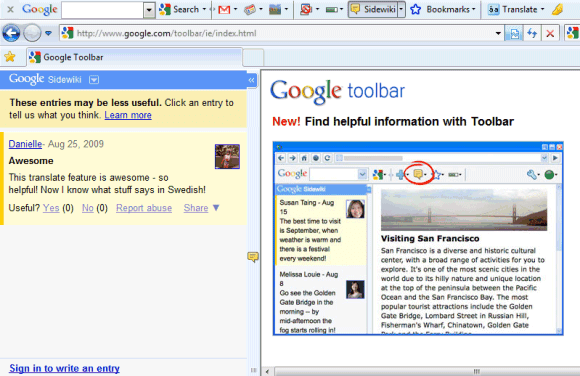 A similar feature is now available in Google Toolbar. 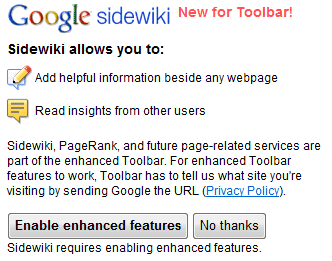 Google Sidewiki lets you enter comments about any web page and shows some of the best comments in a sidebar. The feature is integrated with Google Profiles, so you can find more information about the author and read other Sidewiki comments. Google notifies you if there are comments about the current page, so you need to send your browsing history to use the feature. Sorting the comments by date wouldn't be a great idea, because spam and silly comments like "lol" or "cool site" would be prevalent. That's why, Google developed a ranking algorithm that takes into account many signals: user votes, author's authority, text analysis. Danny Sullivan says that "Google has a language sophistication detector now, and one that works in the 14 different languages that Sidewiki supports". Learning some information about a site, finding if a certain company is reputable or reading a comment that corrects some errors from an article - all are use cases for Sidewiki, but it remains to be seen if Google manages to rank comments properly. As with Knol, Google encourages experts to post comments in Sidewiki: "What if everyone, from a local expert to a renowned doctor, had an easy way of sharing their insights with you about any page on the web?" Unfortunately, experts don't have an incentive to post comments and isn't always easy to distinguish experts from opinionated users. Larry Page once said that Google wasn't supposed to be a search engine. "We built a ranking system to deal with annotations. We wanted to annotate the web--build a system so that after you'd viewed a page you could click and see what smart comments other people had about it. But how do you decide who gets to annotate Yahoo? We needed to figure out how to choose which annotations people should look at, which meant that we needed to figure out which other sites contained comments we should classify as authoritative. Hence PageRank." Is the full toolbar truly necessary? It has a whole bunch of stuff that I neither want nor need. Why not an add-on that puts one little button in the status bar, with the number of sidewiki notes in a little notification circle? Heck, it could even change color when a page has notes rather than not having them. simply a bookmarklet would be enough. Can a webmaster block this from being used on their site? Interesting article and blog, but what a surprise to get an ad for the Scientology at the bottom of your article in my Google Reader. See screen capture here : http://picasaweb.google.com/lh/photo/AMAjA2hqLnZUmuie6WQ6eA?feat=directlink. I will not come back if I find again such an ad on this site. I found out about Sidewiki this morning at about 9AM I must say it's cool but I't does need some improvement tho. I ask my self why would you guys mix comments with trackbacks of blog posts? And not just all blogs or some blogs but only 5-10 blogs out of Million-Zilion-Fufillion blogs? Kind of irritates me that only top blogs that already have enough of traffic get even more traffic "sponsored by Google?" This is great! There are several sites that I check regularly that have no commenting system but really could use one. Integration with Google Reader (e.g. showing if there are any sidewiki comments at the bottom of the item) would be great too! Yes, searched about the sidewiki...looks helpful. The only thing Google needs to work on is chrome. All it's other features are good anyway. > that have no commenting system but really could use one. have you ever heard about http://komenti.org ? There is already a site like this, it is thecommentdepot.com where you can comment on anything. The moderators will even create new categories on request. I already use the site. It's just a comment system, with no way to amplify the signal vs the noise. Yo dawg, we'll just put a comment system in the comment system so we can comment on the comments on the web page while we comment on the web page. I'll bet that in a year from now, nobody is going to even remember what SideWiki was. I'm not able to use sidewiki because of blocked google profile. I would like to be able to send my profile for re-check, but seems that the relative link doesn't work. Why sidewiki is connected to the google profile? 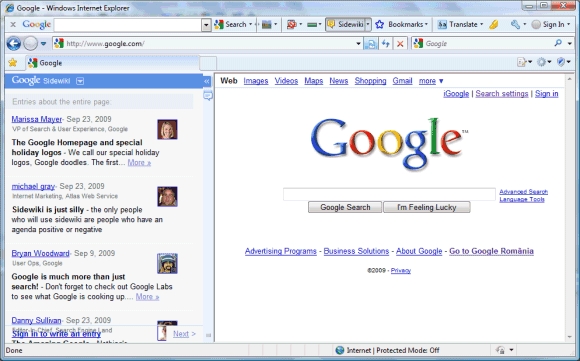 Why does Google Sidewiki not work in Google's Chrome browser? Bad idea, and it is an invasion of website owners property. Many of us webmasters are fighting back and will continue to fight google all the way. All google has done is allowed anybody to post comments that look like it is on your site. Why is this bad ? Simple - that means spammers, warez freaks, competition can post comments and leave links on your site and thus taking away your customers and visitors. The worse part is what if you have a family website and some spammers starts leaving adult ads and links ? There is so many ways this thing can be used for evil it is sick.. This is why I created blocksidewiki.com which is the only true solution online to block sidewiki comments. It is php, mysql, and ajax based which means additional improvements can and will be made to continue to block google and their evil tool. Scam site ? LOL .. Sorry bud, been in business online for over 15 years. Nothing is a scam.. What google is doing is wrong and many developers and webmasters are fighting them all the way. I will be glad when those large companies get their lawyers involved and take google to court for their illegal actions. People better take it seriously because google is in fact taking over your website. I also would like to see integration with Google Reader. Specifically a two-way integration where when I can both comment from Google Reader and read other commenters. I still don't know how adding a wiki can be useful in a Google search. Most likely, it will face the same problems that Wikipedia and other wikis have, such as useless content. Hope they can find some good use for this one soon. Sidewiki - Crabzy - same but less powerfull. I believe Sidewiki is nothing more than what offers Crabzy, and even less because Crabzy offers forum's functionalities, where you can have dialogs, exchanges between users. I'd rather go to Crabzy.com, but they both offer great value as this kind of service, if more developped, could really enrich the Web !!! !